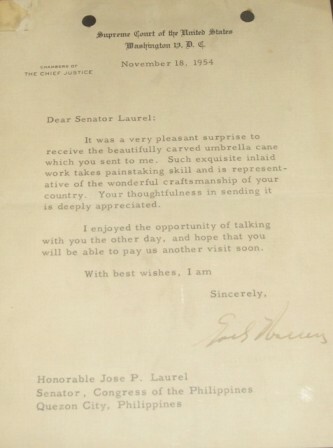 Letter from Chief Justice Earl Warren, Chief Justice of the Supreme Court of the United States, Washington 14, D.C. to Senator Laurel about the beautifully carved umbrella cane and his thoughtfulness in sending it, November 18, 1954. Guy Potter Benton, University of the Philippines President to Dr. Jose P. Laurel appointing him Professorial Lecturer on Municipal Government. 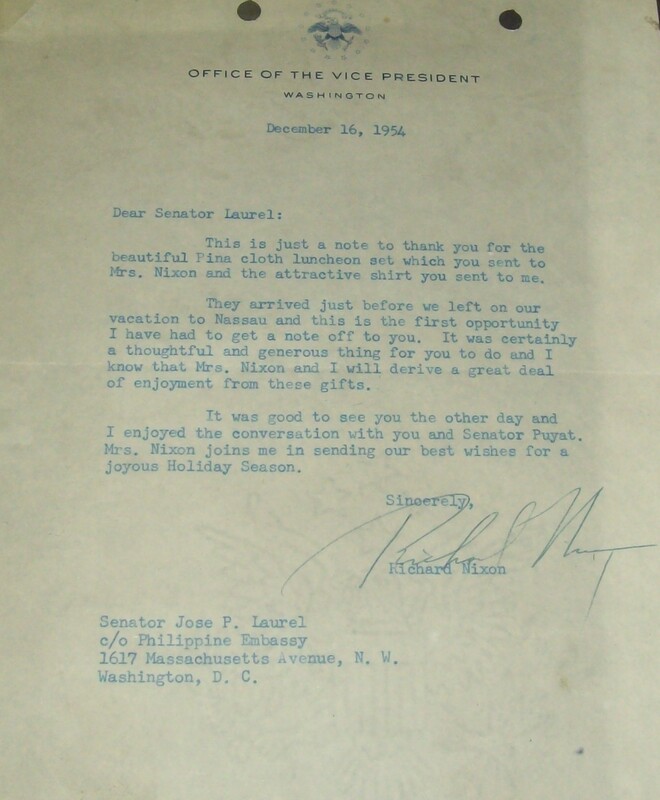 Letter from Richard Nixon Vice President of the U.S. Washington, D.C. to Senator Jose P. Laurel c/o Philippine Embassy, 1617 Massachusettes Avenue, N.W., Washington D.C. Thanking Senator Laurel for the beautiful Piña cloth luncheon set sent to Mrs. Nixon and the attractive shirt he received, December 16, 1954. 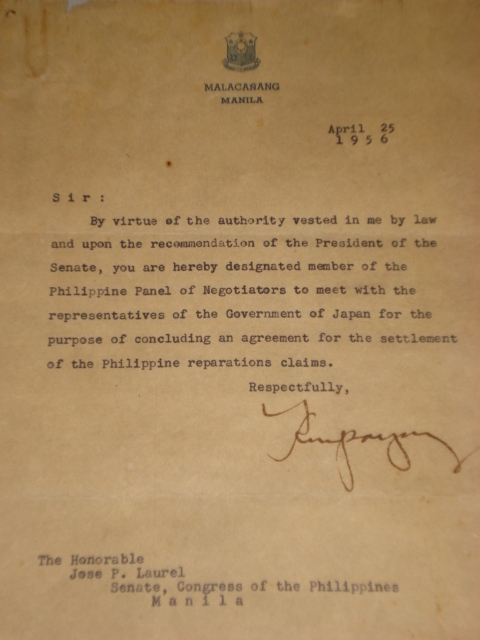 Ramon Magsaysay to Dr. Jose P. Laurel - designating him member of the Philippine Panel of Negotiators regarding the Philippine reparations claims. 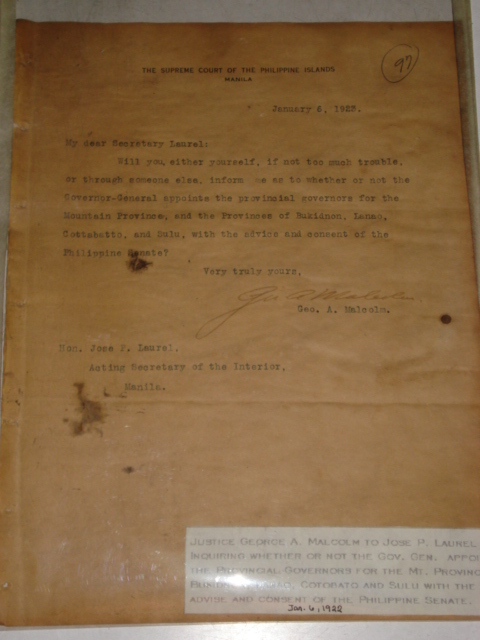 Justice George A. Malcolm to Dr. Jose P. Laurel inquiring whether or not the Governor-General appoints the provincial governors for the Mountain Province, Bukidnon, Lanao, Cotabato and Sulu with the advise and consent of the Philippine Senate. 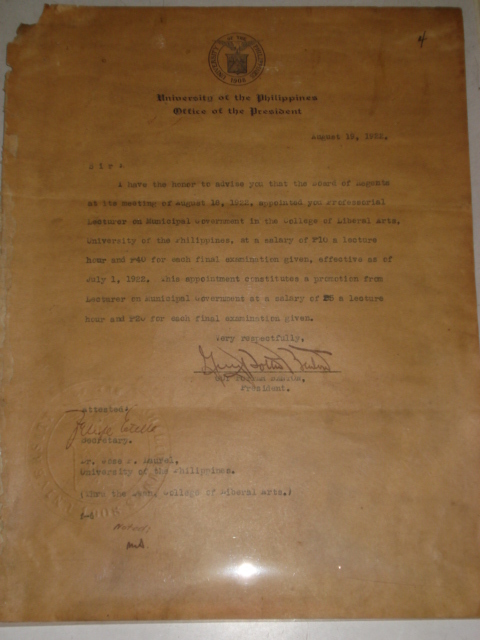 Letter from Hubert H. Humprey, Minnesota, U.S. Senate Washington, D.C. to Senator Laurel, Philippine Embassy, 2253 R. St., N.W. 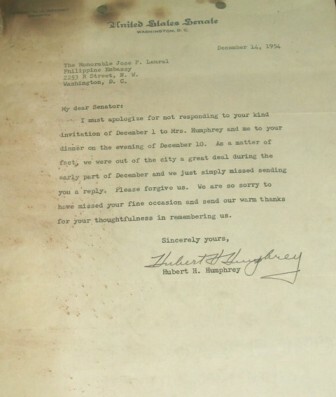 Washington, D.C.. To apologize for not responding to a dinner invitation for he and his wife were out of the city and simply missed sending their reply, December 14, 1954. 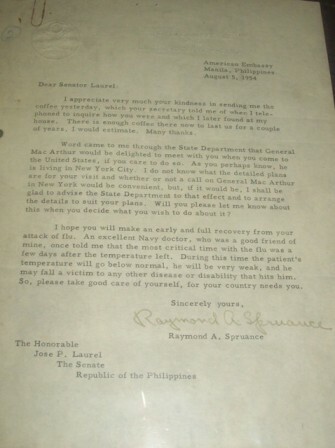 Letter from Ambassador Raymond A. Spruance to Senator Laurel, thanking JPL for the coffee he sent and the projected meeting with General Douglas Mac Arthur, August 5, 1954.